John Haywood is a British record producer, arranger, composer and pianist. 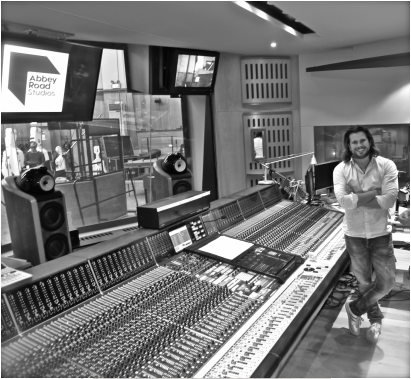 John's production, arrangements and performance credits include classical-crossover artists such as David Garrett, Hayley Westenra, Laura Wright, London Community Gospel Choir, Skunk Anansie, Natasha Marsh, Tony Henry, Geoff Sewell, The Ayoub Sisters and Military Wives. John is also a well-renowned sport titles producer and wrote title music for Football Euro Cup 2008, 2012 and 2016, FA Cup 2009, Rugby World Cup 2011 and 2015, FIFA World Cup 2014 for ITV sport television. John's production for a classical-crossover accordionist with his self-titled album 'Martynas' (Universal Music) rose to UK Classical Charts number 1. His ITV sport titles for Football World Cup 2014 featuring Thiago Them hit number 5 position in UK Official Charts. John co-wrote and produced the song 'Invincible' which was used for the opening ceremony of HRH Prince Harry's Invictus Games 2014 which features on the album 'Sound of Strength' by the English crossover-soprano Laura Wright for Universal Music. In 2016 John's song 'Invincible' which he produced for Laura Wright was featured in the Invictus Games 2016. It rose to #1 position in the classical iTunes Single Charts together with Gareth Malone's Invictus Games Choir and was broadcasted worldwide on BBC and ESPN. John is best known for his frequent collaboration with the virtuoso violinist David Garrett, including co-production credits on his multi-platinum albums 'Virtuoso', 'Encore', 'Rock Symphonies', 'Music' and 'Explosive'. As a performing pianist and keyboardist John has toured extensively with David Garrett throughout the world including mainland Europe, Asia, USA, Canada, South America, Israel, Russia and United Arab Emirates. In 2017 John produced the new album of The Ayoub Sisters, a multi-instrumental duo which was nominated for Global Awards 2018. The Christmas album of Britain’s renowned 'Military Wives Choirs UK' which John produced for BMG Music in 2016 was their biggest project yet featuring over 1000 wives from 65 choirs across the UK and overseas. The album was ranked No 2 on Classical Album Charts and held its position for several weeks. Currently John is co-producing their new album to be launched mid 2018. John graduated from the Royal College of Music, London in 1997 after studying a four-year Bmus (Hons) RCM degree in piano & composition and is a member of The Music Producers Guild.